Lots of animals live on the African plains. Elephants, lions, zebras, hippos, giraffes — we aren’t sure exactly how they live, so animal researchers are constantly studying them in order to find out more. 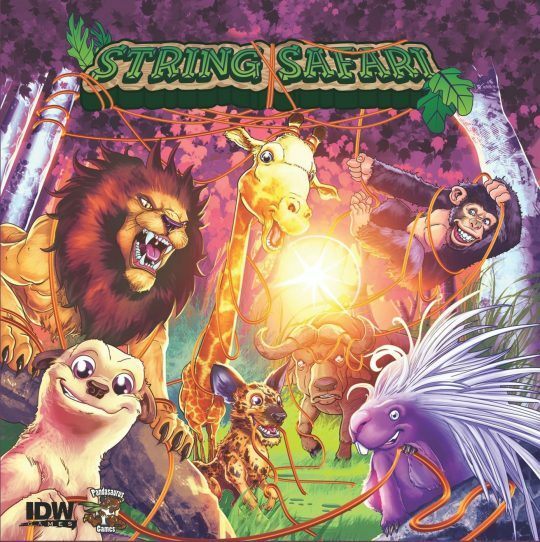 In String Safari (a.k.a. String Savanna), the players are zoologists, trying to get as much information as possible about the animals scattered across the savanna to complete research goals. Before you can study the animals, though, you need to have them under control, so you’ll need to enclose them in your study range — that is, your string — which earns you a point at the same time. The animals all have different attributes, and the topography also influences your ability to study the animals. In the end, whoever completes the most research on the correct animals wins.